How do you know when you have reached the expiration date with your hair stylist? An even bigger issue is, how do you break up with her. Just like any relationship, some are not meant to stand the test of time. What was once a perfect partnership can evolve into habit and comfort zone. Sometimes it’s easier to stick with what we know, even if we aren’t excited about it, rather than try something new. Here are some sure signs that it is time to make a change in who is styling your hair. 1. Your stylist doesn’t suggest updates to your look. You walk in the salon, sit in the chair and your stylist immediately begins your service in the same manner that it has been done for the last 10 years. The color is already out, or you go straight back to the shampoo bowl for your cut. There should always be a conversation about how your hair is working for you and what your goals for that appointment will be. Additionally, your stylist should be giving you options based on the season, lifestyle changes and/or the condition of your hair. Even if you decide to not take the change, it shows that your stylist is working on keeping your hair up-to-date and healthy. 2. Your stylist is more personality than talent. I know so many women who admit that they sacrifice satisfaction because they love the personality of their stylist. One of my mentors once told me that being a hair stylist is 90% personality and 10% skill. It’s true, no one wants to have a wet blanket as their stylist. But you are paying for skill, not story telling. Skill should be at least 50% of the package. Your hair should be 110% awesome when you leave the salon. Cut perfectly, colored beautifully and styled amazingly so you look and feel like a supermodel. Don’t cheat yourself of that because you look forward to hearing about the crazy party your stylist went to last weekend. 3. Your stylist doesn’t take the time to teach you how to recreate your look at home. Part of every appointment should include a conversation about what products are being used, why they are perfect for you and great tips on how to get the same look at home. It doesn’t matter if you have been seeing your stylist for 6 months or 16 years, your hair should look salon beautiful everyday. Your stylist should make the right tools available to you and teach you how to use them to give you the power of style. 4. Your stylist isn’t respectful of your time. All stylist have unexpected events that on occasion cause them to run 10-15 minutes behind, but if your stylist chronically runs late it is disrespectful of your time. Time is valuable. If you organize your day to arrive on time for your appointment, your stylist should be just as thoughtful. You can make a request with the receptionist or your stylist to be on time, but if it isn’t resolved, it may be time to move on. 5. Your stylist doesn’t take part in continuing education. Like many industries, the hair world is always evolving. Product technology, trends, and techniques all change regularly. The most effective way for hair stylists to keep up-to-date is to attend continuing education courses. 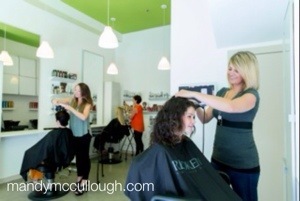 Most states do not require continuing education hours to maintain licensing, therefore it is a choice for stylists. If you were going to see a doctor would you rather see the one who hasn’t updated their education in 25 years or a doctor who regularly invests their time staying up-to-date on the latest innovations for your health. Easy answer, right? Shouldn’t it be the same for your hair? Relate to any of these situations? No? Yay! You have an amazing stylist! Stay with them and they will be sure to make you beautiful forever. Now, if something hit close to home, give your stylist the benefit of the doubt. Tell them what you need from them. Chances are they will work hard to make you happy, but if the conversation takes place and you don’t see the change…it might be time to sit in someone else’s chair. PS – Want to know how to find a new stylist and fall in love all over again? Read “How to Find Your Perfect Hairstylist” to make it easy! Thank you for your feedback and comments! Wow! I had no idea how popular this topic would be. Many of you wanted tips on how to break up with your stylist so here you go! It’s not you it’s me. Give your stylist a call or send them an email. Explain how much you have appreciated their work but you feel you want a fresh perspective. This isn’t a reflection of their work, rather you wanting to get someone else’s opinion. I have had this conversation with clients in my career. I always appreciate them letting me know rather than just disappearing. If they are moving on because I didn’t do my job, shame on me. If they want to “date around” I always encourage it, many times they realize we had a good thing and come back. A good hairstylist will support you and be understanding. Not comfortable with the first two options? Just do it. Go cold turkey. Set up a consultation with a new stylist and if you like her, make the appointment. It’s your hair. Don’t apologize. You deserve to to have amazing hair. If you run into your former stylist, don’t hide. Instead, smile, say hello, give her/him a big hug. You can do it! Breaking up is hard to do. You may feel awkward, sad, or, guilty, but this too shall pass. Do your best to leave respectfully and enjoy building a new relationship with your next stylist.